Make Amanohashidate a World Heritage Site! 2014/03/04 Activity Records In 2013, we held a symposium to discuss Amanohashidate becoming a World Heritage Site. 2014/01/30 Activity Records We submitted a letter demanding that countermeasures be taken again the increase of broadleaf trees in Amanohashidate. 2013/12/06 Activity Records On December 1st, 2013, we greatly improved the appearance of our “Amanohashidate Winter Pine Treelined Promenade”. 2013/10/01 News You can see aerial footage of the event. 2013/8/12 Organization (Members) Thanks so much! We had 5,000 individual members participate. 2013/04/14 Activity Records We also held our "Clean Hashidate One Person, One Tsubo Project" campaign, where everyone cleaned up one tsubo, or 3.3 square meters. There were around 2,100 participants, and 8 metric tons of trash was collected. Thank you all very much. Here at "The Committee to Make Amanohashidate a World Heritage Site Miyazu Kyoto", our goal is to get Amanohashidate registered by UNESCO. Amanohashidate, a special place of scenic beauty with its white sand and green pine, is known as one of Japan's three scenic views. It is loved by many writers and artists, and has been a strong influence on Japanese art and culture. To preserve Amanohashidate for future generations, Kyoto Prefecture, as well as Miyazu, Ine, and Yosano city propose it as a candidate for the UNESCO World Heritage List. Unfortunately, it did not become one in 2008 during the last inspection by the Agency for Cultural Affairs, but given that Amanohashidate has always been esteemed very highly, we are dedicated towards solving this issue and proving its value internationally. 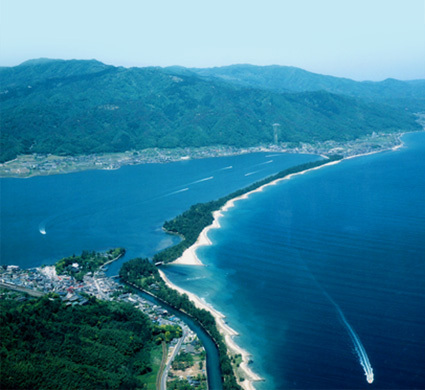 We at the Committee to Make Amanohashidate a World Heritage Site, who live in Amanohashidate, believe it is very important to learn, love and share more about Amanohashidate, and to impart it to our children. We work towards this goal in ways such as sharing information at our symposiums and preserving the beauty of our region. We ask for your support and participation.